The flora is very special in oligotrophic lakes. One of the characteristic plants is Lobelia dortmannii. On the picture you can see some other species. The grass-like plants in the middle are Isoetes echinospora, and to the left are Litorella uniflora. Isoetes echinospora is a spore-plant related to ferns. The closely related Isoetes lacustris grows also in oligotrophic lakes and is more frequent than I. echinospora. But both species are on the danish Red List. Isoetes has 4 large air-channels in the leaves. Litorella uniflora is the most hardy of the waterplants from oligotrophic lakes. It is the last species to dissappear from the lake after a pollution. It has many small air-channels in the leaves. Lobelia dortmannii is easy to find during flowering. The long flowering stems rises above the water with small blue flowers. Lobelia has 2 large air-channels in the leaves. 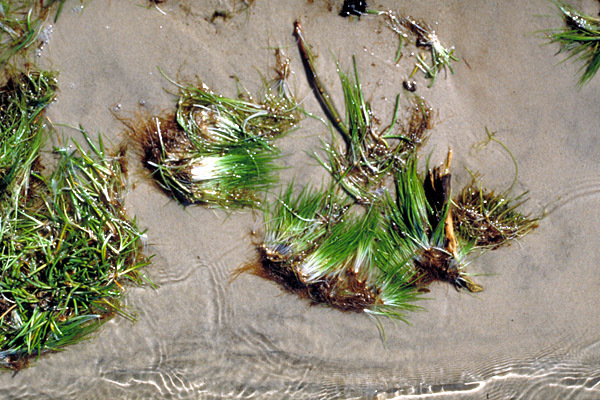 A number of other rare species can be found in or along the shores of oligotrophic lakes eg. Ranunculus reptans, Elatine hexandra, Myriophyllum alterniflorum, Eleocharis acicularis and multicaulis, Pilularia globulifera and Callitriche hermaphroditica. Back to Oligotrophic lakes in Thy.